Enjoying the ocean is a double edged sword. With estimates that up to 5.25 trillion plastic particles are currently floating about Big Blue, it is critical, more than ever, that we all, collectively, make choices to lessen the impact of our enjoyment upon the Earth’s waters. According to a recent United Nations report, 80% of all pollution in the oceans comes from people on land, and over eight million tons of plastic ends up in oceans each year. This waste annually costs the lives of one million seabirds and 100,000 marine mammals and causes $8 billion in damage to marine ecosystems. Finding out how to make easy changes to our habits can seem confusing. Sixty six percent of global millennials are willing to spend more on brands that are sustainable, according to a State of Fashion 2018 report by BoF & McKinsey. Yet according to a LIM college report, only 34 percent of millennials assert they would actually buy sustainably produced goods. 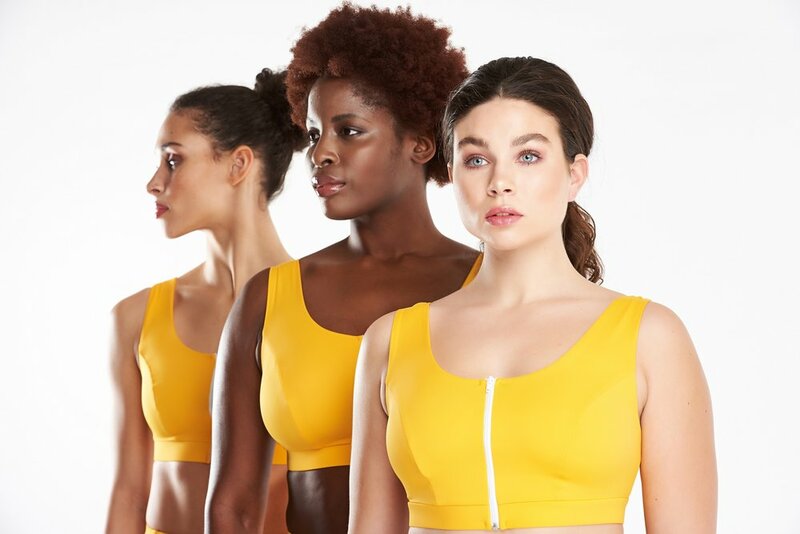 Further more, the Oeko-Tex report states that although 60 percent show interest in sustainable clothing, only 37 percent say they have actually purchased them. Sharing digestible, concise information as to how one can initiate change into daily life is critical. For the millions of us who love to play in our planet’s stunning oceans, through surf, swim and more, we often bear witness to the shocking ramifications of industries and human waste on our natural environments. But it is easier than ever to make simple changes. For beach-going babes with a penchant for swimwear who want to still be able to wear rocking swimwear that holds-up to whatever their form of play in the water is can rejoice, as there is a wide spectrum of both independent and well-known brands working on sustainable swimwear. Check out our bumper round-up of our favourite sustainable swimwear brands for 2019, with analysis on their best practices and run down of key styles. At British-born Davy J swimwear, every suit is manufactured in the UK. They pride themselves on being a “circular brand”, considering the value and use of the resources that go into their suits. Their “Waste Collection” is made using ECONYL®, a 100% regenerated nylon made from waste including abandoned or spent fishing nets, plastic components and textile discards. With double lined, high elastane compositions providing extra strength, durability and shape; hidden rubber edging and cross back designs, Davy J’s highly durable and style conscious designs means these babies will last long, and once done, Davy J encourage consumers to send their suits back at the the end of their life for regeneration or reuse of materials. Furthermore, for every 100 Davy J suits sold, around 9kg of waste has been regenerated, and through a collaboration with the Healthy Seas Initiative, spent and ghost fishing nets are actively collected by volunteer divers and fishing communities and fed into the regeneration process to prevent the damage they can have to wildlife and ecosystems. Perennial swimwear favourites Volcom’s rock-n-roll drenched designs have gone another level following their radical collaborations with rock royalty, muse Georgia May Jagger. Now stepping up to the mark with their eco-conscious collection as part of a deeper brand sustainability initiative, many swim pieces at Volcom are now made from recycled ECONYL®., consisting of 91% recycled nylon. 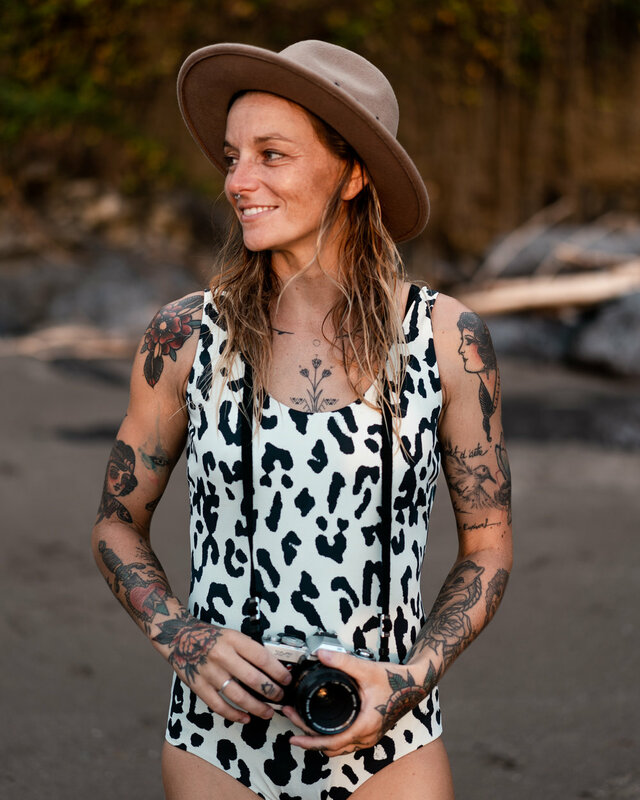 Ambassadors wearing the collection include their long-term muse, Georgia May Jagger, and pro-surfer, ripper queen Maud Le Car. Hot on our radar are London-based premium swimwear brand Stay Wild Swim, new to the mix, and making waves with their strong eco-policy and bold designs. Created by renowned fitness bloggers and passionate advocates of sustainable practices to help clean up our oceans Zanna Van Dijk and Natalie Glaze, Stay Wild swimwear is made from regenerated ocean plastic, and designed to flatter all women. The proof is in the pudding, fighting this issue through regenerating marine plastic into beautiful and functional swimwear. crafted from premium Italian ECONYL® yarn and embroidered used RPET made from recycled water bottles. We love their bold designs and ethos, and significantly too, that their sizing runs from 6 up to 18. Mad To Live have a long-term love affair with British-born cold-water surf brand Finisterre, a company with strong sustainability best practices. Recently achieving B-Corp status, reinforcing their strong track record, B Corporations are for-profit companies who voluntarily meet rigorous standards of social and environmental performance, accountability and sustainability. B Corps are aiming to make a real difference by voluntarily holding themselves to higher levels of transparency and accountability, offering a different way to do business. The ‘B’ stands for benefit – that the company prioritises the benefit to all stakeholders including its workers, as well as the community, and the environment. Finisterre’s original manifesto of a commitment to product, environment and people has stood strong in the 15 years since it’s inception. Achieving B-corp status is a testement to this, and we are excited about their forthcoming work Wetsuits From Wetsuits they have been working on to recycle used wetsuits to make new suits. Their current swimwear and wetsuit collections directly tackle plastic pollution in our oceans by taking nylon waste, from carpet offcuts to discarded fishing nets, and turning it into a high performance swimwear fibre. Finisterre’s new Ostrea bikini, a bold colour block bikini for sun, surf or swim, is made using ECONYL® recycled yarn, from sources including disused fishing nets. SLO (Sustainable Luxury Oceanwear) active is a social enterprise dedicated to cleaning and protecting the ocean, through oceanwear and activism. Their Earth to Ocean model is simple: for every piece you buy, SLO will donate to one of their ocean charity partners of choice. With giving back to the ocean at the heart of SLO, their active cause is currently focused on combatting plastic pollution, since it’s estimated that there are over 5.25 trillion plastic particles currently floating around in the world’s oceans, negatively impacting marine, terrestrial, freshwater and ecosystems, and the organisms that live in these habitats. The high luxury Clean Lines collection launching next month is delicately crafted in a small factory in Italy. The monochromatic Clean Lines collection is made from high-quality FSC certified Yulex Pure – a plant-based alternative to conventional, non-renewable neoprene. Designed for the active ocean lover, Clean Lines boasts classic, athletic-cut sports crops and one-pieces with zip front and contoured panels, paired with classic-cut, high waist or cheeky bikini bottoms to sculpt to the silhouette and support for an action-packed day in the water. All of this, whilst dedicated to causing the least possible environmental harm. Hailing from the Cornish coastline in the UK, sand&palm is handmade in Newquay by founder Vicki Jones in her seaside studio. With zero waste at the forefront of sand&palm, items are made to order, with minimal amounts of stock so nothing goes to waste. Sand&palm’s lycra comes from 100% regenerated nylon from ghost fishing nets, as well as other post consumer plastic waste, their bikini bags made from organic calico, and organic hemp utilised in their apparel and beachwear. Hemp is one of the most sustainable crops on the planet, and is beautifully soft against the skin. Adding to the mix the fact sand&palm’s tags are made from 100% recycled paper, the tag string organic hemp, and the cardboard packaging 100% recycled paper, and we have a strong forerunner in sand&palm for sustainability best practice. Oh yeah, and their suits are absolutely, CUTE AF. A post-consumer initiative enocurages customers not to throw suits away - sand&palm encourage offering to a friend, exchange them for something else, take them to a clothing bank or a charity shop. If Tilia Rose’s awesome shark-print suits don’t hook you straight off the bat, then a deeper look at their sustainability practices may draw you in. Working from a fair trade, ethically verified factory which provides healthy, safe working space, good living wage, no forced labour and complete transparency, Tilia Rose produce a small amount of swimwear with each order which is much kinder on the environment. None of their swimwear is seasonal, meaning they don't throw any of it away. No fast-fashion here. Utilising non-toxic inks, their next new designs being dropping soon will be made from 100% recycled plastic. They also send out their pieces in compostable packaging so its eco friendly from start to finish. We heart their radical shark and dino-print one pieces and bikinis, which we road-tested out in the water and stand the test of shred. Tide + Seek had us at Hello with their summer-drenched designs, rad-detailed suits and bright colour hues. New to the market, and a testament to the fact that sustainable swimwear doesn’t equate to bland, Tide + Swim importantly also boast a strong commitment to sustainable best practice. Featuring playful prints and athletic-inspired silhouettes, the 30-piece collection features printed swimsuits, colourful bikinis, beach-ready pieces made using 100% recycled Repreve fabric and loaded with UV 50 protection. We dig Tide + Seek’s candy floss colours, high cut leg suits, lattice back detailing and strong-eco commitment to boot. And with prices from £12, it’s swimwear that’s friendly on the purse strings too. All Deakin and Blue swimwear to date is crafted from ECONYL® - a 100% regenerated yarn, and made in London by their team of seamstresses. With great fit in mind, every piece is shoppable by dress and bust size to ensure a perfect fit, whatever your shape or size. Deakin and Blue’s sustainablity efforts range from their choice of fabrics, partners and packaging, all the way down to the organisations they partner with. One partnership includes the Marine Conservation Organisations, so that for every swimsuit they sell, the Marine Conservation Organisations remove 2kg rubbish from beaches and oceans world wide. Mad To Live hope you dig the Sustainable Swimwear guide. We will continue to actively shine a light on businesses that are working tirelessly to keep our beautiful Planet Earth clean, and forever tip our hats to those that are. We are huge advocates of Take3 ‘s premise, which encourages you to remove 3 pieces of trash from any beach or water spot you have visited.